Patient portals are one of the main emerging technologies in US healthcare. Portals allow physicians to interact with patients outside of visits, easily distribute test results, and implement online appointment scheduling. While doctors have experienced mixed results in trying to encourage patient engagement with such systems, patient portals are almost certain to become widespread. Many EHRs now feature integrated patient portals, and practices need at least five percent of their patients this year to use such a site, in order to qualify for Meaningful Use Stage 2 incentives. This can be accomplished by getting patients to view, download, or transmit health information over a portal, or send an online message to their provider. 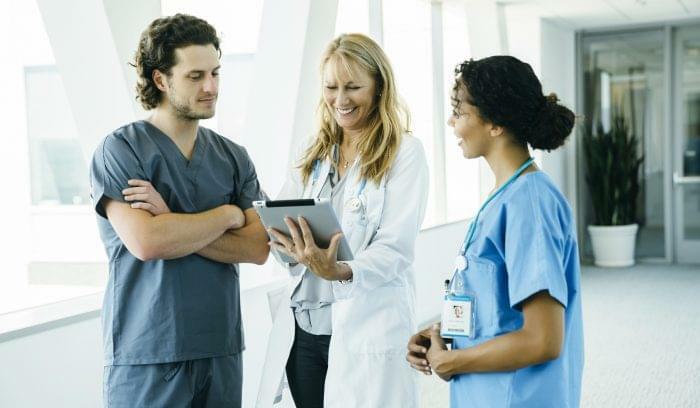 Physician response to these requirements has been well documented, but little research has been conducted on how patients feel about such a significant shift in patient-doctor communication. In an effort to learn more about how patients wish to communicate with their doctors, we surveyed a random sample of 430 patients who had seen their primary care physician within the last year. – Nearly 40 percent of patients are unsure if their primary care physician has a patient portal system. 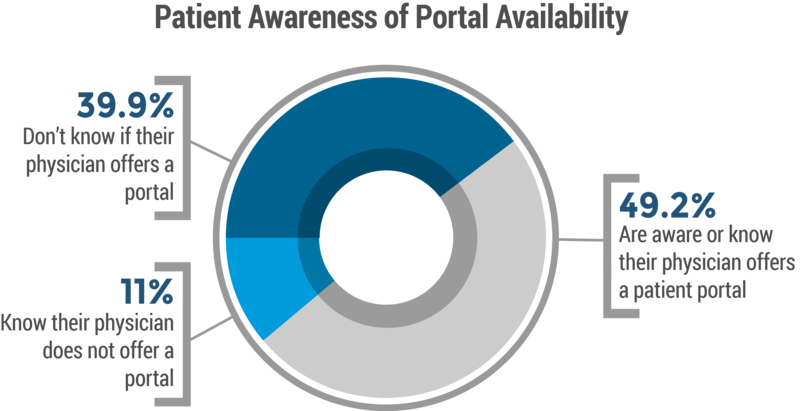 Less than half of patients (49.2 percent) report being shown a portal either during or outside of their visit. – Over half of patients report that their physician did not follow-up with them after their appointment. Of practices that did follow-up, only 9.1 percent did so through a patient portal. – Overall, patients report that the number one way they’d like to schedule appointments is over the phone. However, patients aged 18-24 prefer to use an online calendar. – 42.7 percent of patients prefer to receive test results over the phone. Only 18.1 percent prefer email, and 14.1 percent prefer online messages. In order to establish how effective physicians have been in educating their patients about patient portals, we asked survey respondents whether their physician used such a site, and whether they had been introduced to it. The responses indicate that just under half of primary-care physicians are using patient portal software, and have introduced their patients to it. 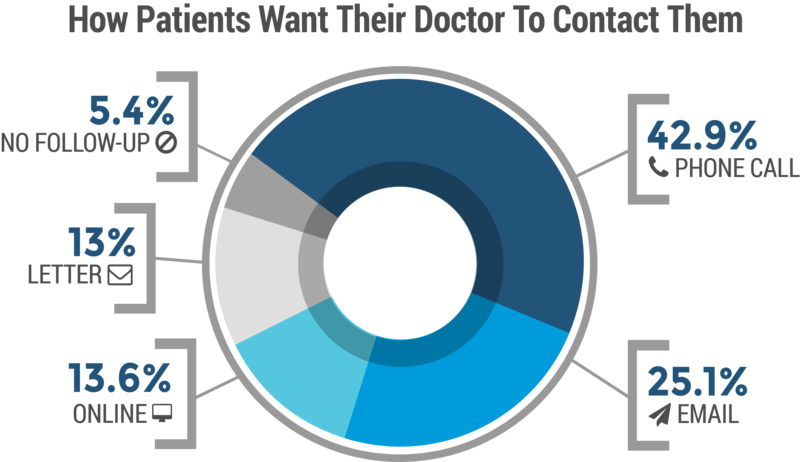 In total, 49.2 percent of patients reported being shown a patient portal either during their recent visit (26.3 percent) or outside of their visit (22.9 percent), presumably by email or phone. However, 39.9 percent of respondents answered “not that I am aware of.” Only 11 percent reported that their physician “did not” offer a patient portal. This suggests that either the majority (50.9 percent) of primary-care physicians do not have a patient portal (which is unlikely given the high EHR adoption rates of primary-care physicians, the Meaningful Use Stage 2 incentives, and the rates reported by private healthcare organizations), or physicians are failing to effectively communicate to patients that such tools exist. Based on these responses, it appears physicians need to invest more time and resources in educating their patients on the availability of patient portals. Creating in-office orientation programs to walk patients through the portal site would likely reduce the large number of uninformed patients. Such programs would likely boost patient portal interaction numbers as well, and help physicians attest for Meaningful Use Stage 2. To begin gauging patient preference for different forms of communication, we asked how patients would prefer to schedule their next appointment. Looking at the responses, it appears patients generally prefer to schedule visits over the phone. 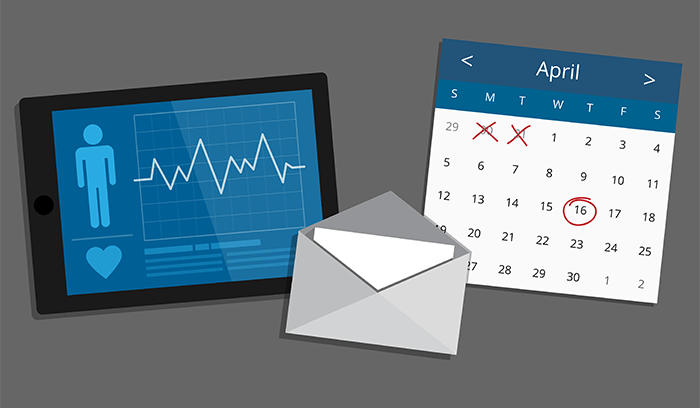 Just over a quarter of patients said they would like to use an online calendar, while just under a quarter prefer scheduling their next appointment while still at the physician’s office. When the responses are broken down by age group we can see a shift among younger patients towards online scheduling. Among respondents aged 18-24, a majority (63.6 percent) said they would prefer using an online calendar. 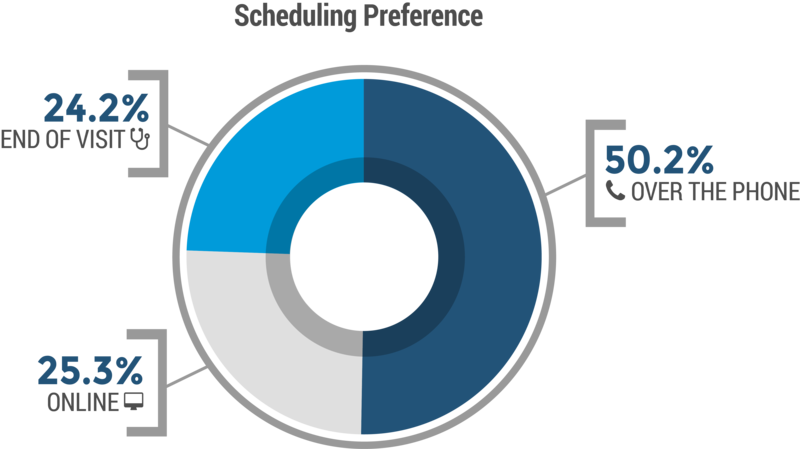 For respondents between 25-34, online calendars and phone scheduling were equally appealing. 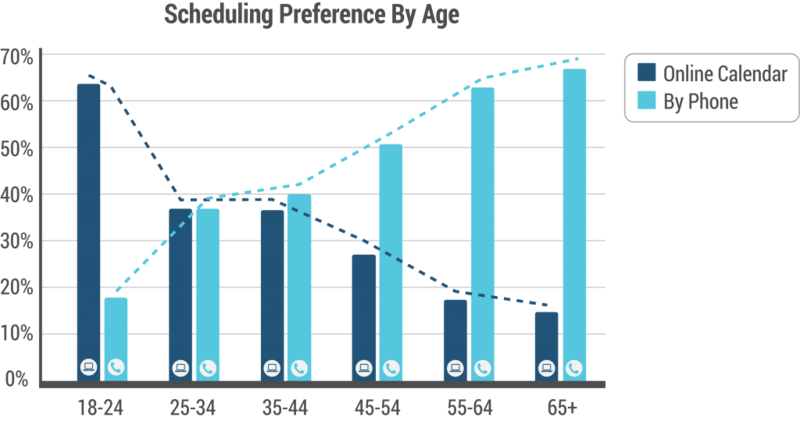 In every age group 35 and above, patients showed a strong preference for scheduling appointments over the phone. These results are not surprising, given general tech and demographic trends. Younger patients are likely more familiar with online appointment scheduling, and potentially have greater access to mobile devices (smartphones and tablets) that facilitate such options. Older patients may be more comfortable scheduling an appointment over the phone, or may be unfamiliar with online calendars and scheduling tools. Given recent health initiatives for better patient engagement (and Stage 2 incentives), it was surprising to find that almost half of primary care physicians didn’t follow-up with their patients after a visit (outside of payment or billing notifications). Of patients who did report a follow-up, only 9.1 percent received it through a patient portal. The most common follow-up method reported by patients is a phone call (23.5 percent), followed by a letter (12.8 percent), and then an online message through a patient portal (9.1 percent). Emails accounted for just over six percent of reported follow-ups. A total of 47.9 percent of respondents meanwhile reported receiving no follow-up, making it by far the most common patient experience. These results suggest there is large room for improvement in post-appointment patient engagement strategies. Physicians are likely missing out on a key opportunity to encourage patient portal usage by failing to orient patients to such online resources, and then failing to provide incentive for them to log on to the platform. For general communication with their physician, patients largely prefer to be contacted by phone. Although phone calls did not garner an absolute majority, it was the most preferred method of communication in every age group (even among 18-24 year olds). Overall, 42.9 percent of respondents indicated it was how they’d like to be contacted for general communications. Email was the next most-requested method of communication with 25.1 percent, while just 13.6 percent of patients chose online messages as their preferred contact method. Interestingly, an additional 13 percent of respondents indicated they’d like their physician to contact them by letter. Unlike the responses for appointment scheduling, there were no significant changes in preference among different age groups for this question. Younger respondents (age 18-24) showed near identical preferences for general communication. This could indicate widespread aversion to using online portals for medical related information, or could reflect a simple lack of familiarity with patient portal interfaces and systems. Unlike online calendars, there are very few comparable types of online platforms that mirror the functionality or use-cases of a patient portal. It is reasonable to assume that patients may not see any immediate advantage to communicating within such a system. Previous experiences with confusing or difficult patient portal software may also be affecting these preferences. Only 5.4 percent of patients responded that they did not want their physician to contact them after an appointment. This suggests that the vast majority of patients would like some type of follow-up communication after their visit. 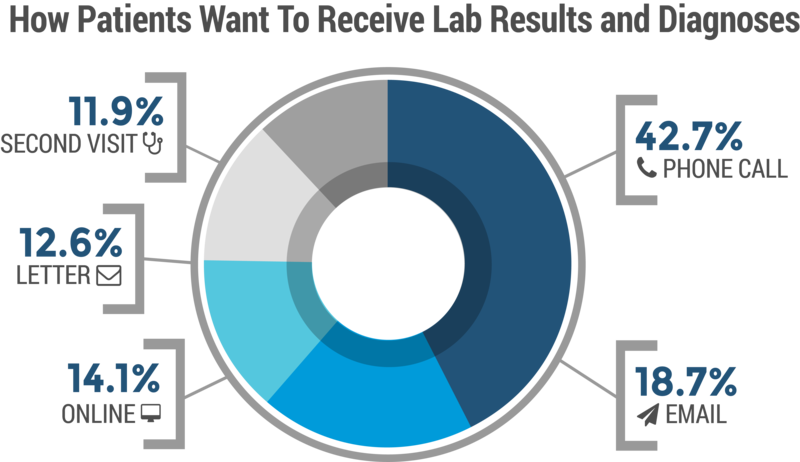 We also surveyed patients on how they would prefer to receive more pressing news, such as completed lab results or diagnoses. Many patient portals are designed to allow patients to easily access such information. Our results indicate however that patients preferred method for such communication is still by phone. Responses here broadly mirror patients preferred method of general communication, indicating that the nature of the message has only minimal impact on patient preference. 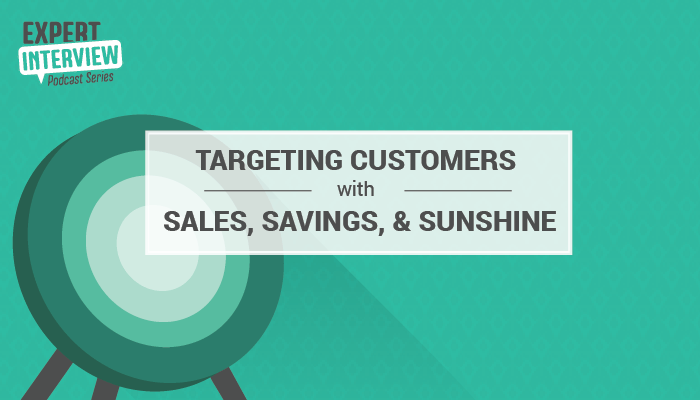 42.7 percent of respondents said they would like to receive such information over the phone. 18.7 percent indicated they would like to receive this type of news by email, and 14.1 percent said they would like an online message. A small but significant proportion of respondents (12.6 percent) said they would like to receive such results by letter, and 11.9 percent would like to come in for a second visit. There were no significant deviations in preference between age groups. While these results suggest that most patients do not wish to receive test results or diagnoses through patient portals, it is unclear whether this is because of the usability of such interfaces, a general uncertainty about transferring medical information online, or some other concern. Additionally, patients may enjoy the ability to later consult or download test results, even if they would prefer to initially hear about them through a different medium. 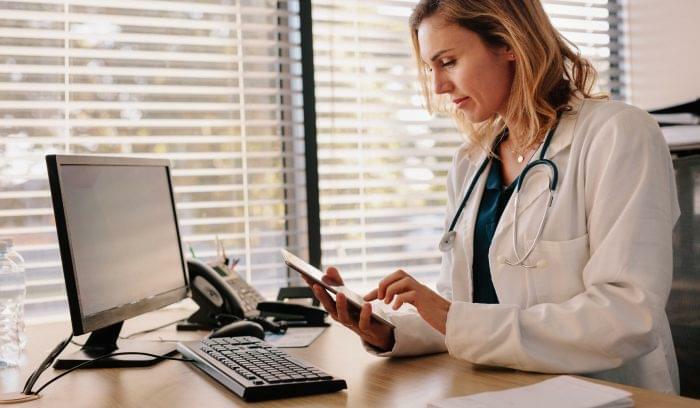 Meaningful Use incentives tied to digital patient engagement and a general shift to integrated EHR platforms all signal that patient portals will become increasingly prominent in the patient-physician relationship. Although younger patients are likely to embrace features such as online scheduling, our results suggest that practices will have a difficult time encouraging continued interaction through online portals. This is especially true for patient-physician communication, as evidenced by patient preference for being contacted and receiving test results by phone. However, these preferences may not be definitive, as a large number of physicians appear to be missing key opportunities for educating their patients about portals, and providing incentive for them to use such sites. Nearly 40 percent of surveyed patients indicated they were unaware of whether their physician had a patient portal at all, and nearly half of all patients reported that their physician did not follow up with them after their visit. These findings suggest that many physicians do not have adequate programs in place to introduce patients to such online resources, and are not engaging their patients post-appointment. By investing more resources and time into such initiatives, physicians will likely be able to raise their patient portal engagement rates, meet Meaningful Use Stage 2 requirements, and cultivate greater acceptance of online portals in their patient populations. Are you looking to implement a patient portal in your practice? Feel free to view our comprehensive list of integrated EHR solutions. For more information about this survey, the methodology, or questions asked, please contact Media Relations Manager Keith Cawley at keith.cawley@technologyadvice.com. Learn more about the benefits of Patient Portal with our market-leading research. The blog is very good and the content also.